COMMENT | So now we have proof that Umno members “cover” for their president. We have proof that the corruption of Umno presidents are covered up by Umno members. We have proof that Umno members will overlook any kind of malfeasances to keep their leader in power. We have this proof because Umno vice-president Ahmad Zahid Hamidi, who is now acting deputy president of the party, admitted as much when he told former prime minister and de facto opposition leader Dr Mahathir Mohamad to shut up or recite Quranic verses to Allah, whichever comes more easily. Let us unpack this statement. We can discern three important facts from it. 1) Zahid does not dispute that the current Umno leader and Prime Minister Najib Abdul Razak has “flaws” and in this case, the only flaws that the current de facto opposition leader Mahathir is unveiling are the numerous corruption scandals that are plaguing this regime. You would note that the Umno acting deputy president is not disputing those flaws, indeed he acknowledges them as human “weakness” that every Umno politician (leader) has. 2) He acknowledges that Umno members “cover” the flaws of their leaders. So, as an Umno member, he is admitting that over the years Umno has engaged in acts to cover the possibly criminal or unconstitutional acts of their leaders to safeguard the position of Umno and the position of the president of Umno and the office of prime minister of this country. 3) That by claiming “there is so much we can reveal”, Zahid is admitting that Umno members have evidence of wrongdoing and have purposely concealed these alleged criminal acts from the state security apparatus, the judiciary, the press but more importantly, the public. So, let me be clear. What Zahid’s statements reveal is that (1) Umno members know that their leaders are corrupt (flaws); (2) that Umno members cover for their leaders; and (3) Umno members have evidence of the wrongdoings of their leaders. How do Umno members cover for their leaders? Now, I am just spitballing here, but they would have to ensure that their leaders are insulated from the banalities of accountability. This would mean that independent institutions that are meant to investigate and prosecute the “flaws” of politicians would have to be accountable to members of Umno, whose primary goal is to cover for their leaders. This would mean that the security apparatus, the judiciary and the press would have to answer to Umno because these would be the institutions that the Umno leader and prime minister would need “covering” from. In other words, Umno members, like Zahid and every other Umno member who are covering for their dear leader, are collaborators and/or accomplices to the crimes committed by their president. Now I am not making an accusation, I am merely clarifying what the Umno deputy president said. So, when Umno members defend the indefensible, when they claim that their leaders have done no wrong, when every state apparatus clears Umno leaders of wrongdoing, what we are left with is the knowledge, articulated by the Umno deputy president, that all this was done because Umno members cover for their leaders. So, this means that the so-called Royal Commission of Inquiry (RCI) on the foreign exchange market (forex) issue of the past is merely an attempt by Umno members to “reveal” the wrongdoings of Mahathir? This would also mean that this RCI is indeed politically motivated in defence of the current Umno president and Malaysian prime minster because Zahid publicly threatened to “reveal” the “shame” and “scabs” of the former prime minister. And why was Salleh shocked? So, let's take this issue of the “appointments as additional judges to the Federal Court”, which has received a fair amount of justified criticism from members of the Bar and former judges. Former chief justice (CJ) Abdul Hamid Mohamad had warned that “an extension of a CJ's tenure beyond the 66 years and six months may compromise the independence of the judiciary”. In other words, what the Najib regime is doing may affect the independence of the judiciary. This brings us to Communications and Multimedia Minister Salleh Said Keruak’s shocking revelation that Mahathir, in his interview with The Guardian implied that jailed political prisoner Anwar Ibrahim “was fixed up by a corrupt judiciary and the judges were dishonest”. Here is the problem. If Umno members cover for their leaders and the only way they can do this is if they control the apparatus of the state, then why is it shocking that a former prime minister implies that the state, through the judiciary, covered up a political problem for an Umno president? If Umno members cover for their leaders, and the only way they can cover for their leaders is by controlling the apparatus of the state and concealing evidence (as articulated by Zahid), then why is it a surprise to the communications and multimedia minister that the former prime minister implies a conspiracy by the state (during his tenure) to imprison a political opponent? If by stacking the judiciary in favour of Umno politicians means that it would be easier to “cover” the flaws of Umno presidents, then why should we be surprised by the fears and warnings that this would lead to an unnatural relationship between the executive and the judiciary as articulated by former CJ Abdul Hamid? With this in mind, how can we not believe that this move by the Registrar of Societies (ROS) to compel the DAP to hold a further round of its central executive committee (CEC) elections is anything but a political gambit by the Umno state to neutralise a political opponent of a compromised Umno president before the upcoming general election? Concerning this crippling of the DAP, this quote from Lim Kit Siang’s blog needs to be addressed. Which is the more plausible proposition? 1) That I have swallowed hook, line and sinker the fake news and false information of this regime and its propagandists. 2) That I was sincerely questioning the strategies (as it were) of an opposition political party that is in the crosshairs of this regime, the state apparatus that they control and the propagandists who serve them. I will leave rational readers to decide which they think is more plausible. 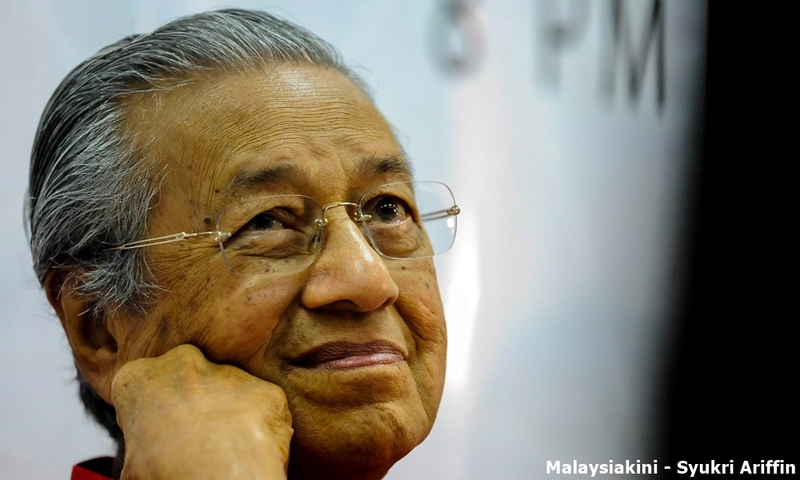 Ultimately, muzzling Mahathir says more of the collective guilt and complicity of Umno members, rather than the agenda of the former prime minister turned de facto opposition leader.